The CDE8452T is the latest in ViewSonic’s product line of interactive large format displays to encourage collaboration in the corporate and education sectors. 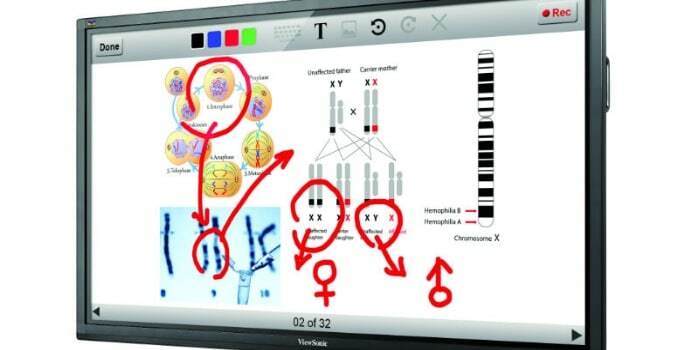 The large-format display with multi-touch interactivity provides a platform for teachers to experiment with and for pupils to enjoy a connected learning experience. ViewSonic believes interactivity is an important way to grasp the attention of young people, helping them to learn and develop through participation. The new CDE8452T interactive display has been specifically designed for the corporate and education sectors, using innovative technologies in high traffic areas to encourage collaborative learning. Delivering four times the detail of Full HD displays, the CDE8452T shows images with more detail, depth and clarity. Even when interacting up close with the 84” touch screen, the images remain vivid and sharp with no noticeable pixilation. The new screen is ideal for higher education and with the 10-point touch-enabled display; up to 10 users can simultaneously write or draw on the display’s surface using their fingers or styluses; ideal for group interaction. The optional slot-in PC provides additional computing power and allows teachers to project their own material and lessons onto the big screen, as well as providing further touch functionality for fast-moving educational environments. ViewBoard™ software (Windows® compatible) also allows students to write, highlight, edit and transform documents and images in real time. In addition, screen recording means lessons can then be shared afterwards. A wireless gateway can be added to improve collaborative functionality. The new ViewSync 3 plugs into the display and allows other devices to stream content to it. The gateway addition will also provide two wireless dongles to accommodate an easy plug-and-play experience; perfect for sharing content. For example, if students were asked to complete a presentation or display homework, this could be projected onto the CDE8452T T screen via a laptop or tablet device. The CDE8452T screen is designed for heavy usage in areas of high traffic – such as in a classroom – with a tempered glass overlay ensuring durability as well as a consistent, high-quality touch experience. The LED screen also features 7H scratch-resistant surface hardness and an anti-glare film that improves screen visibility in bright environments, contributing to the robustness of the product. The CDE8452T can be wall mounted for a solid and safe user-touch experience or ViewSonic can provide a trolley mount that offers the flexibility and versatility of a mobile display. The safety of product users is paramount; the screen is fitted with a rounded-corner design to provide a safer learning environment for active students by helping to prevent injuries in the classroom. The CDE8452T features an energy-saving LED backlight with a lifespan of over 50,000 hours, and more than a decade of durability. This feature lowers power consumption and the cost of ownership, making our products a great long-term investment.